For the first time in five years we were able to agree on additional funding for education in the Minimum Foundation Program with 50% of the increased funding to go to certified teachers and the other 50% allocated to local public school systems for operations. The increased funding will result in certified teachers getting between $500 and $600 additional pay annually. This funding is recurring at the rate of 2.75% increase annually. This is an important step for parish schools to maintain quality education for our students. The increase in funding will result in approximately $3.5 million for the local economy. 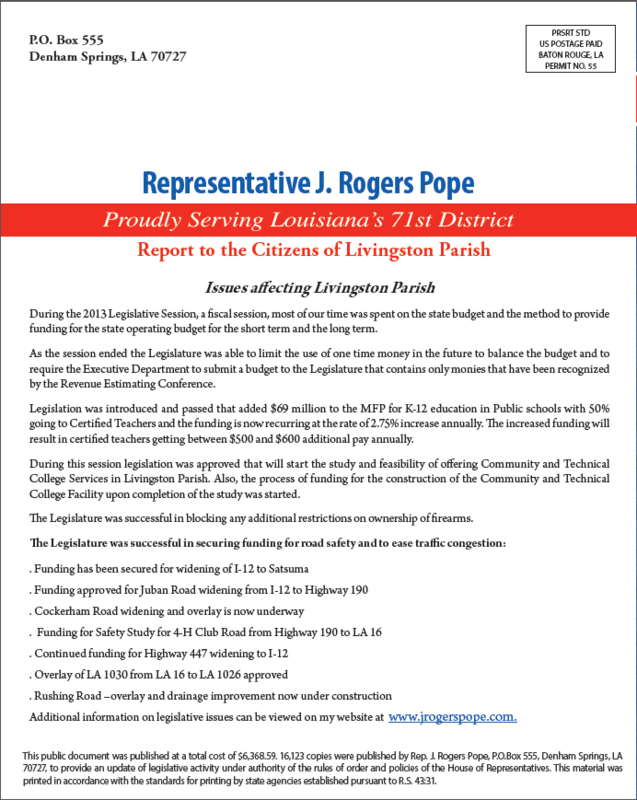 Since taking office as a State Representative for Livingston Parish in 2008, I have worked to address the need for Community and Technical College services in Livingston Parish. During this session we were able to get legislation approved that will start the study and feasibility of offering Community College Services in Livingston Parish and provided for funding for the construction of the Community and Technical College Facility upon completion of the study. In cooperation with Livingston Parish Economic Development we worked to secure $200,000 in Capital Outlay, subject to approval by the Bond Commission, to construct a parking lot at the existing Livingston Technology & Literacy Center. We were successful in passing legislation in the House of Representatives by a vote of 102-0 that would have delayed by one year the changes in the Teacher Evaluation process but was defeated in the Senate Education Committee. I will continue to address this issue and work to make the Teacher Evaluation Process more equitable. We also passed legislation in the House of Representatives that would have required BESE to use the 2011-12 formula for grading schools and school districts but was defeated in the Senate Education Committee. I will continue to work to change the grading process back to the 2011-12 model. During the 2012 Legislative Session, Governor Jindal proposed a drastic change to our public education system that I believe will have a negative impact on the quality of education in Livingston Parish. There is little doubt that these changes will also increase the cost of public education at the local level. I have been working to improve public education for over 38 years in Livingston Parish and Louisiana and I understand that discussion and debate is very important to continue improving education. However, the Jindal education plan was revealed and discussed in a short period of only 16 days with little time for input from legislators or the general public. It was a one way street approach by Governor Jindal to push his education plan through that will change the way we now know public education and nobody knows how much this will cost the taxpayers from the state or local level. I opposed both HB974 and Hb976 and became a vocal opponent to both pieces of legislation as I do not think the proposed changes were in the best interest of our children and local school systems. These changes will certainly have a detrimental impact on the education system in Livingston Parish, as well as, most of the Louisiana Parishes. The positive Education changes in Livingston Parish have come about with input from parents, teachers and administrators and local businesses in our area. The results are very obvious. The main reason there is major economic development growth in Livingston Parish is because of the very good education system. This did not occur overnight. This took years of constant planning , trial and error and discussion with all of the stake holders. Retirement issues were debated and again I found myself opposing the position of Governor Jindal on many of his proposed changes to retirement benefits for our public employees. I opposed the merging of school employees with teacher retirement. I opposed raising retirement age of public employees, opposed raising employee contribution rate of state employees (initially funds would have gone to the state general fund). The Jindal administration proposed drastic changes to the state employee retirement system to reduce state contributions and place contributions in a 401K account. This failed to pass, however, the Jindal administration was able to pass legislation that reduced state contributions and placed contributions in a 401K account for future employees. I opposed all of these efforts to reduce benefits for current and future state employees. I co-authored legislation that allows retirees that are rehired as substitute teachers to collect retirement benefits during reemployment. I supported legislation that provides for the forfeiture of retirement benefits by public officials and employees who are convicted of felony acts associated with their positions. In 2012, The Governor’s Office of Elderly Affairs was targeted by the Jindal Administration to be eliminated and services consolidated with the Department of Health and Human Services. I oppose this move of a unit of state government that has proven its ability to deliver quality services at a reasonable cost to the senior citizens of Louisiana. The Governor’s Office of Elderly Affairs was placed in the Office of the Governor for several reasons, to improve advocacy for the senior citizens of Louisiana and to improve the delivery of services to the senior citizens of Louisiana. Many good programs have come out of the Governor’s Office of Elderly Affairs including the very important Ombudsman Program that provides advocacy for senior citizens who are patients in nursing homes. Without this program many senior citizens would be left to defend for themselves with little, and in some cases, no family support. There was no indication that the moving of the services provided by the Governor’s Office of Elderly Affairs to DHH would benefit the senior citizens of Louisiana. Services would have been possibly be reduced. Sometimes it is not entirely about money and we should always try to make improvements to the benefits for our children and for out senior citizens and while cost should always be a factor, it should not be the only factor. 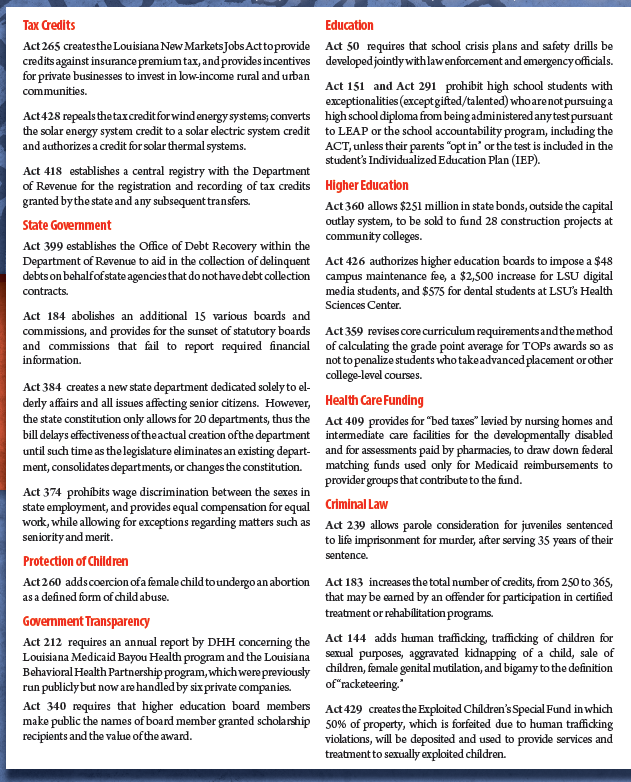 I became a vocal opponent to this legislation and we were successful in defeating this effort. Our senior citizens deserve the best service they can obtain and this move would have diminished services to our senior citizens. 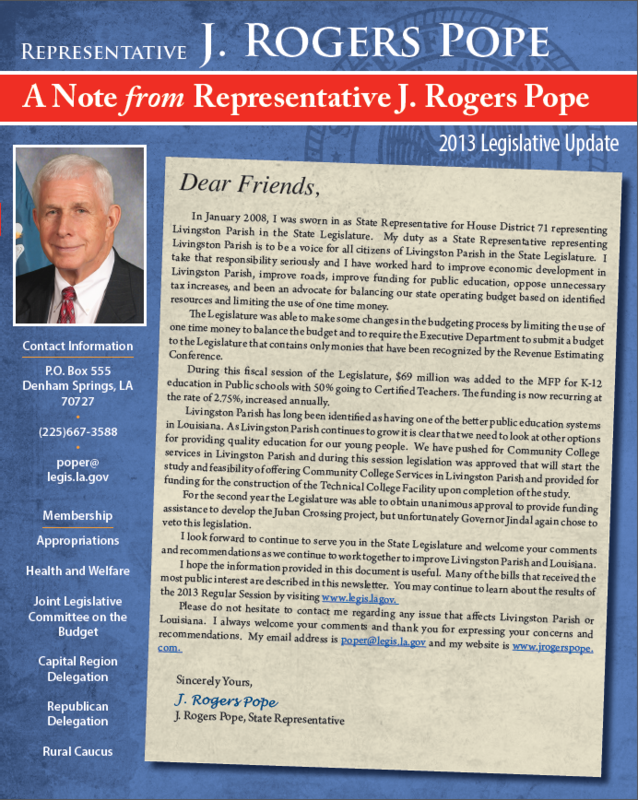 During the 2013 Legislative Session I supported legislation to increase the status of services for the senior citizens in Louisiana by making the office for elderly services a Department in state government. This new department will be called the Department of Elderly Affairs. Economic Development is important to the citizens of Livingston Parish and in 2012 we were able to pass legislation that that provided a funding method for Juban Crossing Development Plan at no cost to taxpayers. 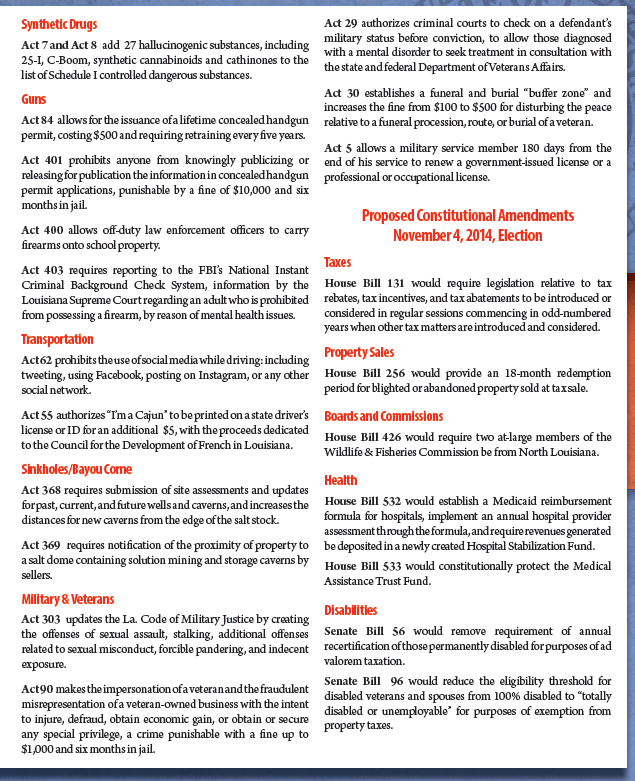 This legislation passed the House and Senate but Governor Jindal vetoed this legislation. The funding method was the same method used to develop other projects in the state and Governor Jindal did not veto those projects. Just Livingston Parish. During the 2013 Legislative Session, I sponsored legislation that again provided a funding process for the Juban Crossing Development. With the support of our Legislative Delegation and Parish Officials-- we were able to again get Legislative Approval from both the House and Senate—overwhelmingly-- and the second time Governor Jindal vetoed this funding for Juban Crossing. It is hard to understand why Governor Jindal, who proposes to support Economic Development and to provide jobs for our citizens plus the fact that this type of funding has been approved by Governor Jindal recently in neighboring parishes---Why he would veto a similar project in the fastest growing parish in Louisiana and the parish where he has received the largest percentage of votes for Governor. We will not give up on this project and will try again next year.